Despite new challenges to their business models, credit unions are choosing to be progressive rather than predatory. Comments from online review sites can help credit unions refine their brand, sales culture, technology, and operations. Mississippi credit unions are opening checking accounts at a faster rate than they’re adding new members. But member relationships run even deeper than deposits. When Denver Community switched charters to expand its membership base, it gained regulatory advocates as well as potential members. PSFCU members reward their credit union’s philanthropy with lasting loyalty. Callahan’s leadership team weighs in on what’s happening around the industry. A look back at the year that was and a sneak peak at the industry’s priorities and expectations for 2014 and beyond. 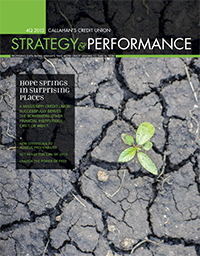 Credit unions adapted to adversity without losing sight of their cooperative values. Such efforts are now paying dividends on and off the balance sheet. Jobs and housing nearly crumbled during the recession. Now, the two economic cornerstones are structurally sound and ready to lift credit unions to a new level of success. What are credit union executives saying about today, tomorrow, and the coming year? Industry leaders share priorities for 2014 and beyond. With a multifaceted support and funding structure, Hope Credit Union is meeting the needs of low-income communities across a growing multistate footprint. Like the Mississippi River for which its home state is named, Hope Credit Union draws from power from many places and instills new life for everyone in its path. Four practices that allow Hope Credit Union to offer high-dollar loans to higher-risk borrowers. By delivering a cultivated message right to the doorstep of regulators and lawmakers, Hope Credit Union is creating a ripple effect that outshines its own reach. Hope Credit Union invests in a shared future of success through a number of philanthropic and community-focused endeavors. Want More? Hear firsthand from the credit union's leaders in the Anatomy Of Hope Credit Union video series. Download the Anatomy Of Hope Credit Union PDF. Innovative pricing models, exacting methods for tracking marketing returns, and the industry’s first monthly membership fee challenge old assumptions about how to pursue profitability. Working through economic shake-ups and shifts in consumer activity, credit unions have demonstrated their adaptability. Competitiveness, income, risk, and engagement drive the results for four distinct pricing models. Arizona Federal Credit Union’s new monthly membership fee was a risky move that has proven to build a more engaged membership. Two credit unions offer tips for tracking and evaluating dollar return on promotions and campaigns. Europay-MasterCard-Visa (EMV) chip cards are set to become the new payment standard in the United States. Here are best practices from early adopters and where cutting edge credit unions are placing there bets for more modern options. A dive into industry data reveals the growing importance of payments-related products and business lines. To EMV Or Wait And See? What’s Next For The Payments Space? Even as credit unions make the switch to EMV-enabled cards, newer payment technology is entering the market. HBO, Starbucks, and Amazon are using freebies to give and get a little extra from their customers. How can credit unions make that strategy work for them? Tap into the power of gratis value-adds and service enhancements to strengthen loyalty and drive business to your organization. Celebrate the brand or celebrate the individual? Either philosophy can help credit unions organize their freebie efforts. Identify the title of the song and the original artist.